The first-ever video advertisement will be published in a traditional paper magazine in September. Each chip can hold up to 40 minutes of video. The first clips will preview programmes from US TV network CBS and show adverts by the drinks company Pepsi. They will appear in 18 September editions of the magazine distributed in Los Angeles and New York. It's believed the new technology will cost much more than normal print ads. However, BBC correspondent Rajesh Mirchandani said that in an increasingly competitive market, advertisers have realised that it is more important than ever to create attention for their product. He likened the technology to the Daily Prophet - a newspaper with moving pictures described in the Harry Potter books. It is not the first time that publishers have experimented with digital technology in magazines. Last year, for example, men's lifestyle magazine Esquire published the first using e-ink technology, with a cover that flashed in alternating patterns. E-ink is the technology used in the Sony Reader and Amazon Kindle electronic books. 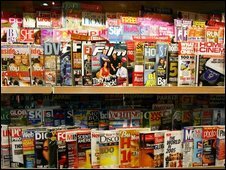 Americhip, the developer of video-in-print, has also created magazine technology that appeals to various senses, including smell. Are e-books the new newspapers?